In BEE Pro you can create templates from scratch or a previously saved message. Templates help you start new messages with a predefined layout or common elements, keeping your message list clean and focused. The templates section is similar to the message list: you can create a new template, search an existing template, change the list order or filter using any of the available tags. Edit the template, opening it in the BEE editor. View the template details, to get a bigger preview and edit the name, description or tags. Copy the template, to duplicate it in a selected brand (multi brands is available in the Agency plan. Freelance & Team subscriptions will just see one option as a destination). Delete it, if you don't need it anymore. When you choose to create a new message, you will be prompted to select a template, which can be one of our default designs - under Default templates - or one of your saved templates - located under My templates. When you mouse over any of the templates, you can either select it by clicking on Use this template or use the Preview feature to take a closer look. You can create a new template by clicking on Create a new template from within the template section, or by selecting Create a template from the message details page (that's the page that is displayed after you save a message or when you click on View details from the Messages page). 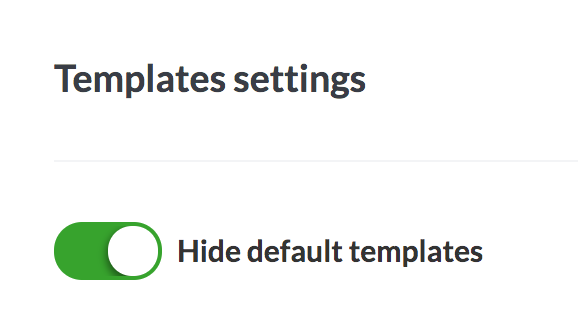 You can decide if default templates are available or not during the message creation process. This option is useful to keep your work focused or force other users to use a specific set of templates. This option is only available for Team and Agency subscriptions. The Agency plan gives you the ability to set a different template option for each brand. How do I add a new template to the catalog?